I have spent several articles describing the creative use of the Korg Volca Sample. Nonetheless, there are many limitations in the design and implementation. Many of these could easily be remedied, resulting in a much more functional and expressive instrument. In this article I list 27 (!) improvements. And then present a redesigned interface. 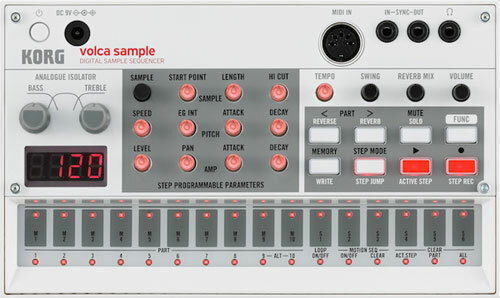 Certain improvements apply to the entire Volca family, but many are specific to the Volca Sample. 2. Replace AC input with USB. Korg chose a bizarre configuration for their AC adapter, making it hard to find a suitable adapter and near impossible to use one you might already have hanging around. If this was replaced with a USB port, standard USB power supplies could be used. 4. Sequence and sound storage. There is currently no way to save sequences, samples, and other data. The USB connection would also allow backing up the Volca. 5. MIDI out. DEM is all about components working well together. MIDI is an essential part of this. That's why add-on MIDI out ports are a hot item with those who use the Volcas regularly. Though full DIN ports are handy, I would be happy with TRS ports, in order to save space. Adapters could be provided, as with the BeatStep Pro. 6. Ports on the back. I hate having cables coming off the top panel, since they get in the way of actually using the unit. And they use up valuable real estate. 7. Power switch on the back. It's real easy to turn the Volcas on and off. Too easy. 8. Master volume on the back. Again, this is a critical control that you likely need to set and forget. In fact, I always run the Volca at maximum, since the output is not that high. A small pot on the back panel next to the output port would be preferable to one on the front. 9. Touch panel functions. On the Volca FM, the touch keyboard serves double-duty to select other functions. On the Volca Sample only six of the touch panel buttons are so used. Several buttons could be eliminated by assigning Mute, Solo, Reverse, Reverb, Step Mode, and Step Jump to the touch strip. 11. Readable colours. White on grey is readable in subdued light. Black on grey (Sample) is not. Neither is grey on black (FM). This is annoying for an instrument designed to be played live. 12. Improved controls. On the Volca Sample, the "analogue isolator" (EQ to you and I) has oversized knobs that move if you breathe on them. The two sliders on the Volca FM have totally different functions but are grouped together as if to be played simultaneously. Again, this is just asking for a performance mistake. 13. LED Brightness. It would be great if the brightness could be turned down, since in a dark environment the LEDs are rather blinding. 15. Meaningful control values. I wrote about this when discussing wavetable synthesis. Rather than display arbitrary values from 0 to 127, the controls (especially Sample Start and Length) should display useful real-world numbers. In this case, these would show the percentage of the waveform being accessed. 16. Additional memory. I have previously described how to get the most from the Volca Sample memory, but what would be the harm in having more than 4 MB? Memory is cheap. A full gigabyte would open up myriad possibilities. 17. Sequence length. The Volca Sample has a sequence of length 16, but why not extend this to 32? This permits far more interesting parts, beat divisions, etc. Another row of touch panels would be needed, but this would double up as a function bar, as already mentioned. 18. Storage locations. Six "Songs" and 10 "Patterns" is enough to arrange an actual song or two. But what if you want to perform an entire set with a Volca? The arbitrary limitation makes this unlikely. But with 32 touch buttons available in my redesign, 32 songs and 32 patterns can easily be accessed. 19. Parts. There's no reason not to increase the number of parts from 10 to 16, with two alt/choke groups. 20. Warp Active Step. This Volca FM function stretches the number of active beats to fit the bar. It can be used to implement triplets and other subdivisions. Especially useful with 32 beats in a bar! Let's have this on the Volca Sample. 21. Reverb per part. Currently the reverb can be turned on per part, but the mix is a master control. With a part selected, this knob should instead control the individual send to the FX bus. 22. Delay FX. Of course there is no end to the digital effects that might be useful. But I think a delay is perfectly suited to a sampler. 23. Display. The displays have improved on the Volcas, the FM being larger than the Sample. In a perfect world we'd have OLED screens that could convey far more information. But no doubt that would up the cost, so I'd be happy with a wider display to show more characters. 24. Editing in song mode. The Volcas are billed as performance devices, instruments for improvising musical variation. The excellent implementation of automation ("motion sequencing") is evidence of this approach. But patterns chained into a Song cannot be edited until you go back to playing single patterns. There is no way to improvise with the Song itself! 25. Instant knob recall. The Beatstep Pro has this cool feature; merely touching a control displays its current value. It's quick to ascertain the current state of the system. On the Volcas you have to change the value once to display the current value. This requires too much dexterity, given the form factor. Normally I end up changing a value by mistake. 26. Sample rate. Would it be too much to implement 44.1 kHz sample rate? Not only would the sound quality improve, files would not have to be specially resampled for the Volca. Finally, I wish to propose a change that might be the most important. This suggestion derives from a simple fact, well known to anyone who has used a MIDI controller. With knobs of fixed range, there is no way to move from one parameter to another, changing values as you go. In the case of the Volca, controller values do not update to reflect the current part. Say that Speed is set to 30 for Part 1 but 40 for Part 2. If you switch from one part to the other, the knob value stays the same. As soon as you tweak the knob, you hear a discontinuous jump in the value. 27. Continuous Encoders. To allow smooth value changes across parts and patterns, enabling more expressive performances. It's particularly odd that this was not implemented, since there is already a continuous controller on the Volca Sample. It's the Sample knob, which moves from 0 to 99 and then continues back to zero seamlessly. It's odd that we have a continuous encoder in one place where it is of negligible benefit! Many of the suggestions point to a redesign of the front panel. I propose further reducing the number of controls. The Volca Sample currently has 11 parameters that can be motion sequenced. Each has a dedicated knob, which is nice. These are transparent and light up when data is active. Also nice. But I would trade the pretty lights for the ability to properly play the encoders. Let's have four large knobs. A dedicated shift button could switch these between three banks of parameters. The larger display would tell us which is active. Above is a rough mock-up of the front panel. It's easier to understand than the current model, plus it puts more performance features at your fingertips. I realise that the Volcas are "one-off" units that have evolved as new models have been released. Both the FM and Sample have features not available on previous units. So perhaps they are not likely to be updated or improved. 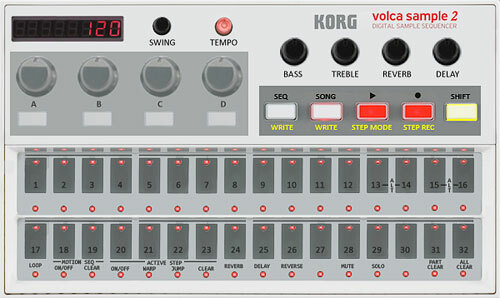 Nonetheless, I petition Korg for a Volca Sample 2. As always, comments are most welcome below. I think the charm of the Volca Sample is its limitation. It's not really designed to be a full-fledged sample player. After initially focusing on its limitations and not really using it for a while, I decided to give it another go and now love it. I use it as a "phrase/loop" player. I use the patterns as collections of 10 loops. I do a lot of motion sequencing to create interesting/musical loops that I can use alongside my hardware samplers, drum machines, etc. I think it's perfect for that, especially when you pass it through some effects - which I do by sending it to a track on the Octatrack. Your suggested upgrades would also increase the price considerably, making the Volca Sample an expensive piece of gear rather than a cheap machine for experimentation and sound design. Certainly every instrument must be used despite limitations... which is why I spent the first few articles describing such things. But this doesn't discount the possibility of improvement. Several hardware manufacturers (that I know of) read my blog and at least one has taken my suggestions on board for a firmware update (Zoom). I don;t make suggestions idly, nor do I expect my wishes to suddenly be granted! Some of the suggestions would increase the Volca's price, but memory is cheap and all of the DSP functionality is already implemented elsewhere. We'd be looking at a small price differential. And the Volca would then be an even better tool for experimentation. Unfortunately, it seems that Korg is no longer interested in this line of products, which is a shame. a small mono oled or even just a backlit LCD aren't exactly expensive (128x32 oled ~$2 off ebay). readable text on the sample and FM would be preferable than trying to decipher what the 7-segment led is trying to tell you. samples could be displayed as filenames.